Posted on December 4, 2017 by K.J. My favorite kind of reading are multiple books, and T. C. Edge has a ten book series that I was excited to get to reading. Book One, The Enhanced, introduces us to a future dystopian earth where genetically modified humans (the Enhanced) live in the upper-crust of society while the rest (Unenhanced) live in the outskirts and are subjugated by the Enhanced. The series follows a 19 year old orphan named Brie Melrose. She lives in a group home with her best friend, Tess, an over-sized clumsy boy, Drum, her caretaker, Mrs. Carmichael, along with several other kids with varying degrees of attitude. Brie finds herself under the scrutiny of the Sevants (the highest level of the Enhanced) which is exactly where she does not want to be. Without giving any spoilers I won’t go into any further details about this first book, or the other nine. (If you are desperate to know, you can go to the author’s page and dive in.) I will, however, review this series as a whole, rather than taking each book one at a time. Overall, I liked this series. T.C. Edge has developed a world that is similar, yet very different from our own. For the most part it is a believable place, and the characters are well developed. The story itself carries the reader through with plenty of action and unexpected twists and turns. I did find myself skim reading a lot of the later books where the main character (Brie) has extensive internal debates and analysis of the world she lives in and the people she is close to. It became overly repetitive and if it had been condensed, ten good books would have made five fantastic books. I also took note of several misspelled words (this is in British English so I am not referring to those differences) along with grammar issues. A few more beta readers might have caught these. There were a couple of major issues that were not resolved by the end of the series. I may have missed something from skim reading, but because they were big holes I would have expected more than a few words to wrap these things up. With that said, I do recommend these books. The story is a good one and the world T. C. has built is believable. Of the entire series my two favorite books were the first, The Enhanced, and the tenth, Renegade. **One final advisory word to the youngest readers; these books do have intense battle scenes which may not be suited for the more sensitive reader. Posted on November 7, 2017 by K.J. 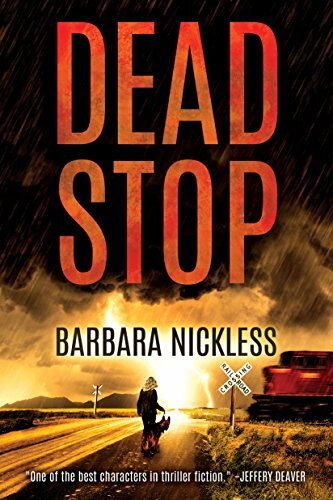 I just finished the second of a three book series by award winning author Barbara Nickless. 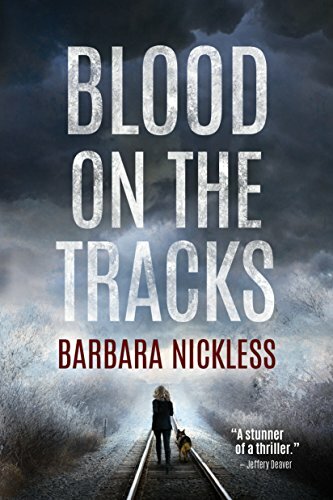 Blood on the Tracks and Dead Stop will set your heart pounding. Special Agent Sydney Rose Parnell is a railroad cop facing grizzly crimes, while fighting an internal battle from her stint as a mortuary specialist in Iraq. 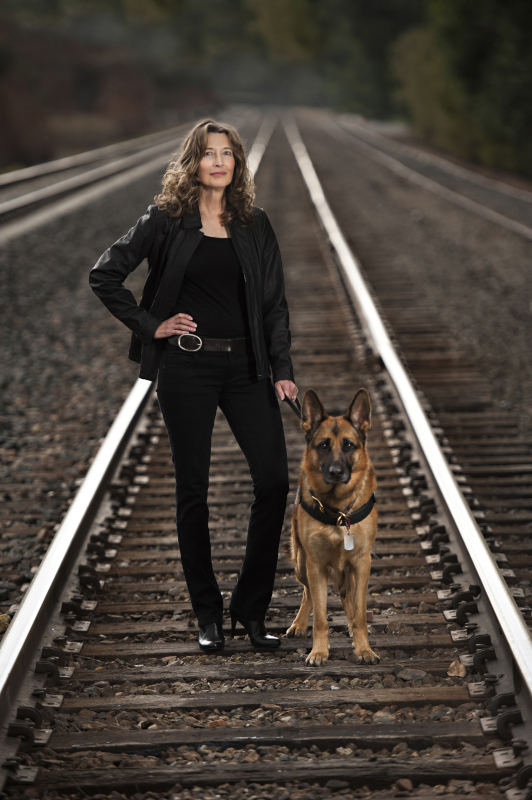 With her K-9 partner, Clyde, she takes the reader on a wild ride solving gut wrenching crimes along the railroad lines in Colorado. The Sydney Rose Parnell Series will put the taste of grit in your mouth, and the feel of grime on your palms. It will keep you guessing to the last pages. Nickless weaves a tight cloth that leaves no lose threads for the reader to reach any conclusions too soon. The Colorado Book Award, presented by Colorado Humanities & the Center for the Book. Daphne du Maurier Award of Excellence for mainstream mystery. Colorado Authors’ League Writing Award for genre fiction. A Suspense Magazine Best Book of 2016. The third installment, Ambush, comes out late in 2018. I am excited to get my hands on Ambush……….I pre-ordered it on Amazon. Author Barbara Nickless with a proud furry friend. Posted on July 31, 2017 by K.J. Among the Lesser Gods explores the question, “If we make a decision in childhood how does that shape and mold our present?” This lovely story is set in the mining town of Leadville, Colorado. A young woman, Elena Alvarez, has made many bad choices in her life beginning with a deadly fire at the age of five. She begrudgingly completes college and is in an unwanted pregnancy. Now, her grandmother invites her to stay with her for the summer and care for a family who has suffered their own losses. Margo Catts’ debut novel is beautifully written. Catts shows how a young woman comes to terms with her past through living in the present. The story pulls the reader in, weaving a delicate tapestry of joy, sadness, elation, devastation, and fulfillment. A great read. Posted on May 23, 2017 by K.J. On May 15th, 2017, Margo Catts launched her debut novel, Among the Lesser Gods. Normally I would be writing a review of her book – which I will be doing soon – but today I am writing about my experience of being “Star Struck”. I have always felt that every human is just a person no matter their social or economic status. As the old saying goes, we all put our pants on one leg at a time. Shirts only go on one arm at a time, and skivvies are in the same category. We all wear them (ok, some people feel skivvies are too binding) and we all put them on essentially the same way. Thus, Mark Zuckerberg and I are on the same playing field in the basics of life. I’m sure that if I met him on the street he may look familiar to me, but I would not really recognize him, much less be star struck for him. But, on that evening in May, I was struck by Margo. Her book launch was at the Tattered Cover, a bookshop where friends gather to sip tea and talk books. It is cozy. When I arrived, Margo had already started her presentation to a group of about 40 adoring fans. Up to this point I had only known Margo during our critique group and at her home for coffee. I met a new side of her. Her presentation had everyone laughing and crying. Her slight nervousness gave her a down to earth eloquence. She spoke of her inspiration for the book and how her curious mind took a tiny article about a fire and turned it into a wonderfully moving novel. After her presentation we all clutched our copies of her books to wait for a few moments with the author and have our copies signed. I ended up toward the end of the line, and was able to chat with several of our writing friends to pass the time. I watched as each new person smiled and had kind words for Margo, and in turn she generously shared hugs and laughter. As soon as I got home, Margo’s book was put where all of my signed copies go – in a book cabinet that holds all of my closest friends (that is, book, friends). I never read the signed copy of a book. That one gets put away to be treasured and I purchase a second copy to dog ear and love. Thank you Margo, for making my first star stricken experience a great one! I can now go back to my regular life putting my pants on one leg at a time. Posted on January 3, 2017 by K.J. This hefty novel opens in 1806 with the meeting of the Great Magic Society. Theoretical magicians meet to discuss their discoveries while reading about, but not practicing, magic. A gentleman does not, after all, practice magic. Ms. Clarke weaves a wonderful tale filled with shadows lurking in dark corners and chilled breezes that sneak through the window cracks. Magic is coming back to England after a 300-year absence, and Mr. Norrell and Jonathan Strange are in the middle of it all as they fumble through dusty spell books. 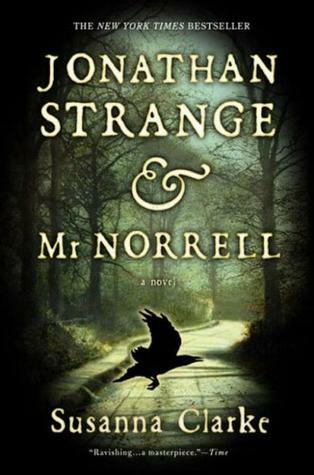 The reader spends the first third of the book with Mr. Norrell and his fussy approach to magic. His counterpart, Jonathan Strange doesn’t make his first appearance until well into the story. The two characters are the opposite of one another in every respect. Mr. Norrell is small, mousey, and reserve in personality and magic. On the opposite side, Jonathan Strange is tall, handsome, and bold. Their lives become deeply intertwined and neither Johnathan Strange nor Mr. Norrell understand the depth until the last chapters and pages. I loved the writing style of Ms. Clarke, which is reminiscent of the time-period in which the book takes place. The humor is dry, and hidden among the words. If you are not an English major, you may miss many of the jokes that are drizzled throughout the book. The writing style is colorful and the reader will be treated to smelling the acrid air and feeling the rough textures. The use of end-notes gives the reader some backstory of side characters and events. They are a fun diversion away from a long story, but they were a little disruptive at times. I skipped a few just to continue with my reading. Overall, this is a great book to lose yourself in. Posted on July 26, 2016 by K.J. The Buried Giant is a book that will leave you thinking long after you have finished reading the last words. Kazuo Ishiguro masterfully weaves a tale of things forgotten, covered in the mists that hang like a curtain at the edge of remembering. The main characters, Axl and Beatrice, are saddened that they live on this precipice to remember their son and, one day, decide to leave their lives behind in order to see him once again. During their journey, across the bleak landscape of Arthurian England, they cross paths with Sir Gawain, the last knight from King Artur’s time, Master Wistan, a Saxon warrior, and young Edwin a cursed boy who becomes Wistan’s apprentice. Mirrored in the undercurrent of the forgotten brutalities during the Briton and Saxon wars the characters face trials in morality, honor and love. The reader is left a little off balance trying to find the thread of The Buried Dragon story, but this seems exactly how it should be. The allegory is strong only if the reader chooses to remember. Posted on January 21, 2016 by K.J. I was pleasantly surprised with this book. The writing is very eloquent. It has a quiet strength to it that the reader may not realize until after reading Ms. Bailey’s story. The main character (the author), who is gravely ill, finds her own strength and resolve through her observations of the daily challenges faced by an unassuming creature. The snail’s simplicity brought a bit of joy to what was a difficult time in her life. I know more about snails than I ever thought possible and was entertained while learning and reading. Some of the historical quotes, facts, and figures got a bit tiring, but it was well balanced with the humanness of the story. I don’t think I’ll look at a snail the same way. From Goodreads: In a work that beautifully demonstrates the rewards of closely observing nature, Elisabeth Bailey shares an inspiring and intimate story of her uncommon encounter with a Neohelix albolabris —a common woodland snail.